Ladbrokes Review - Summary of the Oldest Online Casino out there! Ladbrokes is a real one-stop online gaming center. Virtually any type of wagering an individual wants to partake in, Ladbrokes has an opportunity for you. It really is one of the most diverse and wide-ranging online betting parlors in the industry. A true Ladbrokes casino review gives you an idea of just how this betting spot came to be so popular. How Did Ladbrokes Come to Be? Ladbrokes Online was founded in 2000 while parenting company (Ladbrokes Coral Group plc) exist for more than a century. It is a fully licensed casino holding registration in both the UK as well as Gibraltar. The site is mainly known for its sports bets and Playtech slots with progressive jackpot bonuses. The games available include slots, blackjack, roulette, video poker, baccarat, and live games. 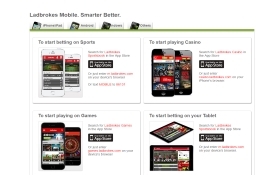 Ladbrokes casino mobile also features bingo, keno, lotteries, and scratch cards. Ladbrokes specifically caters to UK players but is available in four languages total. Massive assortment of games Ladbrokes Casino offers hundreds of exciting top class online casino games to keep you entertained: Blackjack, Roulette, Baccarat, Craps, Classic slots & Video slots and more. 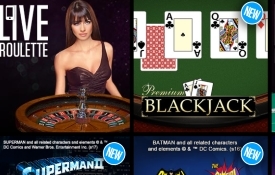 Mobile Apps Their casino games are available on all Android and iPhone & iPad devices. US players are not allowed at Ladbrokes, however for the countries that the Ladbrokes casino is available, almost every major online casino deposit method is supported. This includes Visa, Mastercard, Neteller, Skrill, and a few more including Paypal. Deposits are usually instant at online casinos and Ladbrokes is no different. Payouts on the other hand may take as long as 5 days and customers are said to expect to wait at least 48 hours for the transfer of their funds. 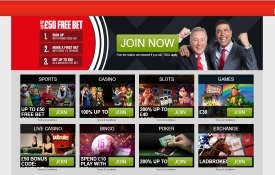 Although there is sports betting, bingo, and lottos among the many gaming options that the Ladbrokes casino review covers the main draw from the site seems to be the slots and the table games. All the slots at Ladbrokes are from the Playtech manufacturer. Some people might like this ease of familiarity while others might prefer a bit more of a variety. Either way there are some nifty, high-quality Ladbrokes slots including those licensed from famous movies such as “Ted” or “Gladiator” in addition to a Mike Tyson punchout slot and a slew of super hero pokies thanks to Playtechs association with the DC Universe. Ladbrokes boasts a 96.72% payout rate. Table games are available on the platform and include roulette, blackjack, hold ’em, baccarat, and many of the traditional casino staples. For those looking for a more realistic gaming experience Ladbrokes also offers live dealers. In these games a live person is actually dealing cards in a streaming window from the Ladbrokes studio. Wins and losses are instantly deducted from an account just as if you were playing on the virtual model. Live games are especially exciting on the roulette wheel. Other live action includes Hold ‘Em, Baccarat, and Blackjack. Any quality casino that wants to stay up to par with their competition these days needs mobile gaming as a mandatory requirement. Ladbrokes casino mobile checks off this box and includes all comfort benefits such as scannable QR Code and downloadable apps. A single account can be used for both the PC version as well as Ladbrokes casino mobile. A full arsenal of Ladbrokes casino mobile games can be played on a smart phone, PC, Mac, or tablet including live dealer table games. One of the best ways for any online casino to stay competitive is by offering promotions and sign up bonuses. It could be argued that the Ladbrokes casino bonus is one of the most aggressive in the industry. This is because Ladbrokes not only matches the initial deposit as many online casinos do – they actually match the first three! The first deposit can be matched up to 150% if using the smart phone app. The second deposit is matched 50% and then Ladbrokes honors the loyalty of a third deposit with a 125% match. All total gamblers can get an extra £1,500 through their Ladbrokes casino bonus. A 20X rollover is required to claim the bonuses but the higher max deposit amounts and the increased matching capabilities make this easier to achieve than one might imagine. In addition, there are certain Ladbrokes casino bonuses available as incentive for downloading their app. A VIP club includes a personal account manager and a dedicated line for service. Loyalty rewards can also earn free money and comped bets help sweeten the pot even more for creating a membership account for the Ladbrokes casino. If you’re eligible to play at Ladbrokes it’s definitely worth the time to create an account. Not only do they offer very enticing sign up and deposit bonuses, they reward you handsomely for using their smart phone app – the preferred method of wagering for most players these days anyway. If you enjoy slots and table games there are plenty of options available as well as poker, bingo, sports betting, and more.